Perhaps the greatest footballer whose entire career was spent playing on the north-west coast, Len Hayes enjoyed a hugely decorated career, winning multiple club and competition Best and Fairest awards. Born in 1922 in the small community of Sisters Creek near Wynyard, Len Hayes’ talent for football first became evident in 1938 at the age of 16. Not only did he make his first appearance in senior football – debuting with and playing in a premiership for Myalla in the Table Cape Football Association – he was also selected as captain of the Tasmanian side for the 1938 National Schoolboys Carnival in Hobart. After further short stints with Yeoman in the Darwin Association in 1940 (which brought another premiership and the Association Best and Fairest at just 17 years old) and APPM in 1941-42, Hayes enlisted in the military during World War II. He served with the AIF 12/50 Infantry Battalion stationed in Darwin, playing in the 12/50’s football side that featured fellow star Tasmanian footballers Alf Tiffin and Ted Pickett. Upon his discharge from the army in late-1944, there were a number of VFL clubs who pursued Hayes. However, he was unwilling to leave his farm at Sisters Creek and opted to remain in Tasmania, returning to football for the 1945 season – this time at senior NWFU level – with Wynyard. From his first game in the NWFU Hayes stamped himself as one of the Union’s most magnificent players. A versatile player most at home at Centre Half Back or Centre Half Forward, Hayes used his great strength and powerful physique to dominate games like few had before or since, and by the time his six-season stint with Wynyard ended after the 1950 season he boasted two NWFU Western Division Best and Fairest awards (1946-47), a Wander Medal as Best and Fairest in the recombined competition (1949), two club champion awards with Wynyard themselves (1949-50) and representative honours for his state at the 1950 National Football Carnival in Brisbane. Alas, for all Hayes’ individual success there would be no premiership with the blue and whites, the closest he would come being a Grand Final loss to East Devonport in 1949. 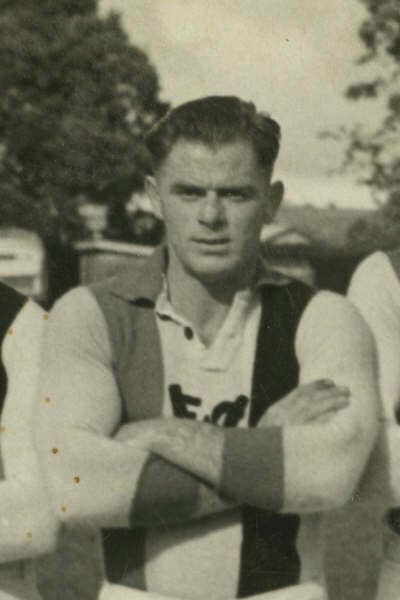 After Cooee approached Hayes with the offer of the captaincy, the 28-year old moved down the coast to play for the Bulldogs for the 1951 season, and he immediately picked up where he had left off with Wynyard, representing Tasmania against Victoria and helping the Bulldogs to the Grand Final, where they were unfortunately crushed by Ulverstone. Over the next seven seasons, Hayes was as one of Cooee’s most influential contributors, winning club Best and Fairests in 1954 and 1956, and remaining – as he had been at Wynyard – a first choice selection for NWFU representative teams. After coaching the club for two years in 1953-54, Hayes final chance for an NWFU premiership came in 1956, but as had been the case five years earlier, Cooee was simply no match for Ulverstone. Even at the very end of his career Hayes was still making an impact, as the 34-year old topped the NWFU goalkicking table with 51 majors in 1957. Hayes retired from senior football at the end of the 1958 season, aged 35, and his contribution and legacy to coastal football was celebrated with all due diligence. His greatest honour however had come three years earlier, when he was the first – and ultimately only – coastal footballer to be afforded the honour of a testimonial match on October 1st, 1955. Hayes moved to Queensland in later life, and he passed away in 2010 at the age of 87.